On 16 January, at the Palais des Nations in Geneva, the Human Rights Council will convene an inter-sessional meeting on the interlinkages between human rights and sustainable development, and on how States can harness the complementarities of international human rights obligations and the SDG commitments to power progress in both areas. 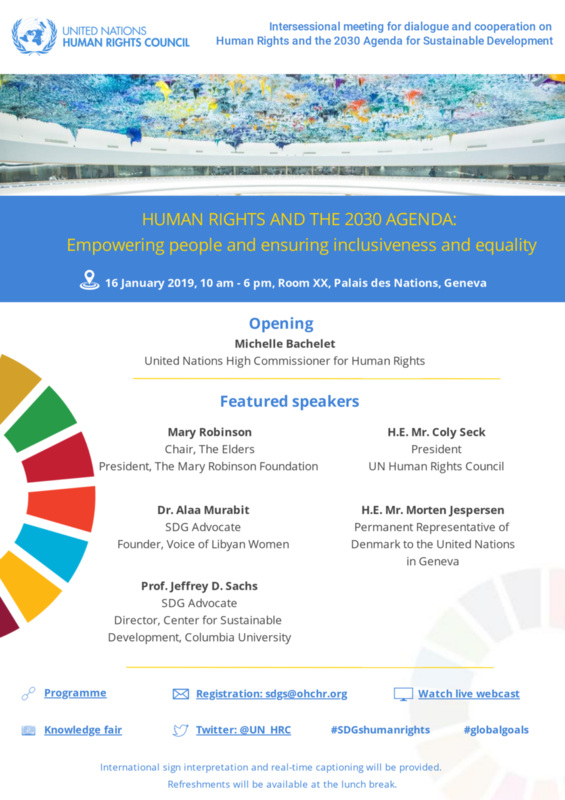 The meeting, entitled ‘Human rights and the 2030 Agenda: Empowering people and ensuring inclusiveness and equality,’ will include keynote interventions by Michelle Bachelet, the UN High Commissioner for Human Rights; Mary Robinson, President of the Elders and former UN High Commissioner for Human Rights; and Jeffrey Sachs, SDG Advocate. More information on the event and the Human Rights Council’s work on human rights and the 2030 Agenda can be found here. The event will be webcast live here and here. The 2030 Agenda is unequivocally anchored in human rights, being explicitly ‘grounded in the UN Charter, the Universal Declaration of Human Rights, international human rights treaties’ and other instruments, including the Declaration on the Right to Development (for more see OHCHR’s Transforming Our World: Human Rights in the 2030 Agenda for Sustainable Development). As the Danish Institute for Human Rights (DIHRs) has shown, 90% of Sustainable Development Goal (SDG) targets are anchored in international human rights instruments (see DIHR’s report on the subject: Human rights and the SDGs). Just as full enjoyment of human rights can only be achieved within a context of worldwide progress on these development goals, the 2030 Agenda and the SDGs can only be accomplished with the support of the international human rights system, and the strengthening of human rights on the ground. Indeed, a number of countries, realising this important truth, have begun to take steps to implement and report on their human rights obligations and SDG commitments in a ‘joined up’ manner. A number of case studies, in this regard, are provided in the Universal Rights Group’s 2018 report ‘Human rights and the Sustainable Development Goals: Pursuing synergies,’ produced with the Governments of Denmark and Chile, and with the DIHR. At its 37th session in March 2018 (HRC37), the Human Rights Council passed a new resolution, tabled by Chile, Denmark and others, entitled ‘The promotion and protection of human rights and the implementation of the 2030 Agenda for Sustainable Development’ (A/HRC/RES/37/24). The resolution is important in that it seeks to make the case that progress with the implementation of States’ human rights obligations and their SDG commitments are mutually interdependent and mutually reinforcing. For example, it recognises that the implementation of the SDGs must be ‘consistent with a State’s obligations under international human rights law,’ and also notes the important contribution that international human rights mechanisms (Treaty Bodies, Special Procedures and the UPR), and the Council itself, make in promoting the implementation of the SDGs. In order to achieve closer coordination between human rights and the 2030 Agenda, the resolution mandated the Office of the High Commissioner for Human Rights (OHCHR) to organise two one-day intersessional meetings for dialogue and cooperation between States, the UN human rights mechanisms and other stakeholders, on human rights and the SDGs. (For more, see Towards a stronger connection between human rights and the 2030 Agenda for Sustainable Development: The role of the Human Rights Council). The Council’s inter-sessional meeting is part of a wider movement to strengthen the links between the UN’s human rights pillar and its development pillar, including in the context of the UN Secretary-General’s current reform agenda. This movement, inter alia, was considered at the 5th Glion Human Rights Dialogue (see report here). (For more on the Secretary-General’s reforms, see The UN Secretary-General’s Reform Agenda: what is it, why is it important, what does it address, and where is the human rights pillar?). In her statement to HRC39 the High Commissioner argued that: ‘the SDGs will not progress without discussion of and progress on the so-called ‘sensitive’ issue of human rights. I know this as a former Head of State and Head of Government: development must focus, above all, on the well-being and rights of the people.’ When she addressed the Third Committee, she noted that the Council and OHCHR help States secure improvements in the promotion and protection of human rights on the ground which, in turn, would represent a major contribution to the realisation of the 2030 Agenda. She noted OHCHR’s work is premised on ensuring a key role for human rights in development policy, and that this is the only way to address inequalities and secure the full implementation of the SDGs.